Ever Heard of the App Touch? Nobody Has, but 12M People Already Use It. An under-the-radar Canadian start-up with more than 12 million users for its free texting app is now trying to break out as a mobile social leader. Enflick, which makes the popular PingChat, is today renaming its app as the more all-embracing and generic “Touch,” and is reshaping it around communication within small private groups. Touch helps dynamic groups of close friends chat and share photos. While that functionality is pretty basic, Touch is designed as a very live app — beyond push notifications, it shows when a user is typing, when a message is delivered and when it’s read. What’s most notable about Touch among all the emerging mobile social competition is that it already has millions of users. For many promising apps, navigating app stores and pockets of smartphone usage to get to critical mass is a huge challenge. Social apps just aren’t as fun or useful without friends, and definitely not without other people. Still, changing up a product users already know and love often makes those users angry. And there are many texting app alternatives, like Kik, WhatsApp and Pinger. 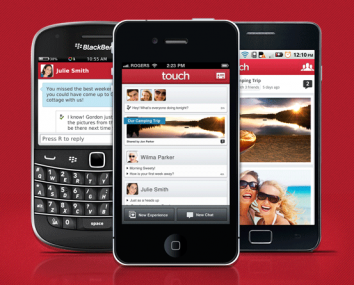 Touch is available for iOS, Android and BlackBerry at launch, with HTML5 coming. Also on the way are video and voice support, Ting said. Enflick was bootstrapped for the past two years, and has a relatively large team of 32 in Waterloo, Ontario. It has now raised $1 million from investors including Freestyle Capital and Menlo Ventures.